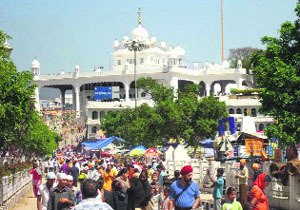 Devotees throng gurdwara Keshgarh Sahib to pay obeisance during the second phase of the six-day Hola Mohalla festival at Anandpur Sahib on Monday. The second phase of the six-day Hola Mohalla started here today. The celebrations of the historic festival began on March 23 at Kiratpur Sahib. The “akhand path” will start at Gurdwara Keshgarh Sahib tomorrow. “Paths” and religious diwans will also be held at other gurdwaras in the town, including Sheesh Ganj Sahib, Bhoura Sahib, Shaheedi Bagh, Guru Ka Bagh, Harian Velan and Gurdarshan Parkash Sahib. The Shiromani Gurdwara Parbandhak Committee (SGPC) is expecting the arrival of more than 25 lakh devotees in the town for the festival, which will conclude on March 28. A number of groups of nihangs have started reaching the town to participate in “Mohalla” (religious procession) on March 27, which will be followed by a display of martial arts during the closing ceremony. Hundreds of social organisations from different villages have set up community kitchens, which will serve a variety of delicacies to the visitors. Various political parties have also started preparations to organise their conferences. The Congress, which did not organise any conference last year, will hold one near the Panj Piara park while tents are being erected by the Shiromani Akali Dal (SAD) at the main ground opposite Gurdwara Keshgarh Sahib. The SAD (Mann) will organise a conference near the sarovar. As the entry of trucks and buses has been banned in the town till March 28, the district administration today started a free shuttle service for the visitors.